NESTA, a UK-based charity promoting innovation (and which also organised the annual UK Barcamp Bank), just released its new report on alternative finance trends in the UK. It is a goldmine. The report if full of interesting charts and figures and in many ways tells us a lot about the current state of our traditional financial sector (and possibly of the stance of monetary policy). 79 per cent of borrowers had attempted to get a bank loan before turning to P2P business lending, with only 22 per cent of borrowers being offered a bank loan. 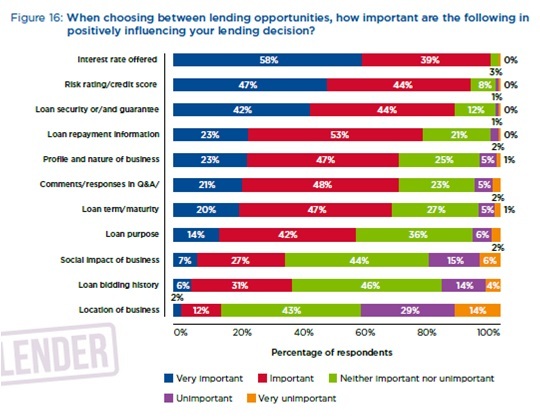 33 per cent thought it was unlikely or very unlikely that they would have been able to secure funding elsewhere had they not been successful in getting a loan through the P2P business lending platform, whereas 44 per cent of respondents thought they would have been likely or very likely to secure funding from other sources had they not used P2P business lending. Given bank regulation that penalises banks for lending to small firms, none of this is surprising. As I keep saying, regulation is the primary driver of financial innovation. 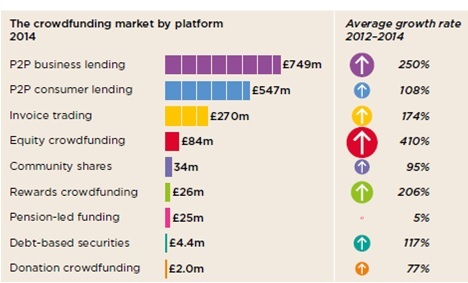 P2P business lending owes a lot to regulators… until it gets regulated itself? 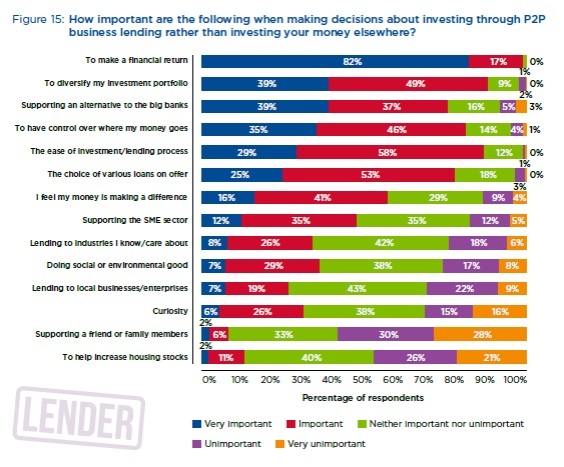 [The funders] in P2P lending and equity-based crowdfunding were primarily driven by the prospect of financial returns with less concern for backing local businesses or supporting social causes. Figures concerning P2P consumer lending are similar. Those figures are both worrying and encouraging. Worrying because the harm that low interest rates and regulation seem to have on the economy and the traditional banking sector. Encouraging because finance is reorganising itself to respond to both borrowers’ and lenders’ demands. This is spontaneous order at work. Let just hope this does not add another layer of complexity and opacity to our already overly-complex financial system. Can’t put most p2p investments in an ISA or Sipp yet. I use my low income wife as a tax shelter for p2p, 0% marginal tax on returns. They should have asked for household income or wealth, not personal.